Young Queen Elizabeth I's path to the throne has been a perilous one, and already she faces a dangerous crisis. French troops have landed in Scotland to quell a rebel Protestant army, and Elizabeth fears once they are entrenched on the border, they will invade England. Isabel Thornleigh has returned to London from the New World with her Spanish husband, Carlos Valverde, and their young son. Ever the queen's loyal servant, Isabel is recruited to smuggle money to the Scottish rebels. Yet Elizabeth's trust only goes so far—Isabel's son will be the queen's pampered hostage until she completes her mission. Matters grow worse when Isabel's husband is engaged as military advisor to the French, putting the couple on opposite sides in a deadly cold war. 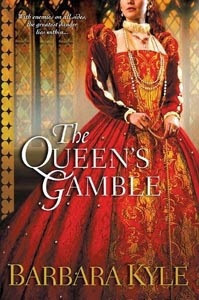 The newest installment of Barbara Kyle’s Thornleigh series, The Queen’s Gamble, is a great historical mystery novel set in the early reign of Elizabeth I. Readers meet up again with the Thornleigh family, but this time it’s the Thornleigh’s daughter, Isabel, and their son-in-law, Carlos, who are in the spotlight. Isabel has been blackmailed by the queen into aiding the rebels in Scotland who are fighting the French (and thus keeping them too busy to invade England) and her husband, Carlos, is called upon by duty to assist his lord, the French king. Spouses now find themselves on either side of a war neither of them wants and their small family is now at the mercy of a queen who will do anything to save her country. Beyond the religious strife running rampant through England and the threat of an invading French army, there is also inner-conflict within the Thornleigh family that makes for some interesting reading! This is my second foray into the Thornleigh series and I have found both books to be really enjoyable. All four novels can be read as stand-alone novels, and while I don't feel I missed anything with not reading the first two books, I still wish that I had more knowledge on the background of the characters. Historical mysteries are great escape reads for me, fictional characters set during real historical events, and Kyle has a real talent for writing page-turning action. All in all, I found The Queen’s Gamble to be a fun and entertaining read, jam packed with intrigue and adventure and I am looking forward to the next book in the series! For more information on Barbara Kyle and her novels, please visit her WEBSITE. Amy, I'm delighted you so enjoyed THE QUEEN'S GAMBLE. Thanks for this opportunity to reach out to your legion of loyal readers! I have read two novels in this series as well and this was by far my favorite. I loved how the historical figures did not overshadow the main characters. I have read a lot on Elizabeth I lately so I was glad the story kept her as a looming threat instead of a major player in every chapter. Svea, I so appreciated your review at "Muse In The Fog". I'm glad you like my technique of focusing on the non-royal characters - I do feel we relate to them more than kings & queens.